I was trying to Jailbreak my iPhone iOS 4.3.1 today but encountered a big problem when it cannot exit from the Recovery Mode. I tried several methods to kick out of Recovery Mode using Tiny Umbrella and Fix Recovery but failed. The error 1013 kept appearing after restoring the iOS 4.3.1. If you have tried updating to the recently released iOS 4.3.1 update on iPhone 4 and encountered Error Code 1013 or Error Code 1611, then you are a not alone. This has been a common issue across all iOS devices updating to iOS 4.3.1 and Apple Support Discussion forums are full of users complaining about this issue. This bug has apparently been reported to Apple but if you don’t fancy waiting for an official fix, you can follow this guide to try and successfully update your iOS device to 4.3.1. Update (April 11, 2011) - Read this article regarding Apple official statement regarding the problem - "Unauthorized modification of iOS has been a major source of instability, disruption of services, and other issues"
Before doing so, you may also like to try and restore using a different computer. Warning Note: This will result in your iPhone 4 baseband being upgraded to the latest version. Step 1. On your Mac, go to your “Applications” folder. Step 2. Now navigate to the “Utilities” folder. Step 4. Type “sudo nano /etc/hosts” (without quotes) and hit return. Step 6. Use the down arrow key to find the “gs.apple.com” entries. Once the cursor is in front, make sure you comment out the line(s) by entering “#” in front of the text. Step 7. Save the file by pressing CONTROL+O. Step 8. Exit the nano editor by pressing CONTROL+X. Step 9. Restore your iDevice. Step 3. Click “Open..” from File menu. Also try to check out this Tip from Karthik. In TinyUmbrella, go to Advanced tab and make sure you uncheck “Set Hosts to Cydia on Exit” option. 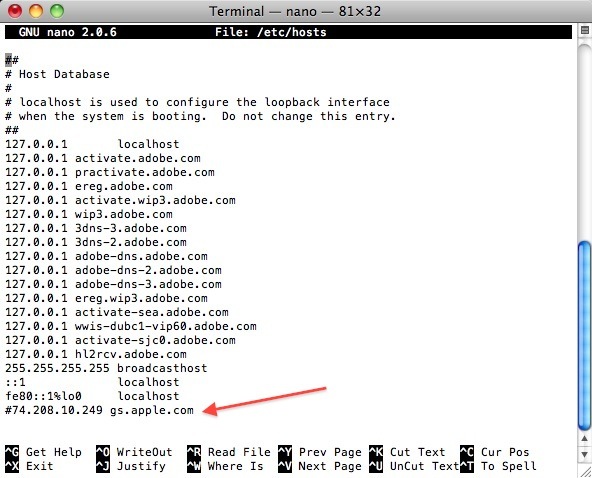 As a double check, make sure you don’t have an entry in hosts file in your computer for gs.apple.com. If you do, comment it out and try the restore process again. when the system is booting. Do not change this entry. I have no reason to prevent my system from talking to gs.apple.com. It just takes a little longer to do so. There are thousands of iphone users right now who have iphones locked into recovery mode, probably because they are on a slow internet connection and their threashold is being exceeded. These folks are innocent victims of of the pursuit of the jail break users. Apple needs to figure out another way to do this with out impacting loyal customers. Apple. shame on you. "